Links to three Chicago climbs are below. The "Hustle up the Hancock" has always been special to me, and has always been my focus. The Children's Memorial climb also has a warm place in my heart. I never really look to my team to fund-raise, though some of my team-mates have done a spectacular job of that! All three climbs are for wonderful causes. We prepare and participate in the Hustle with a little more intensity than the others. 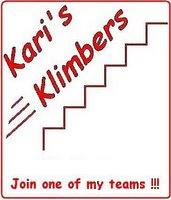 Just sign up and climb!!! John Hancock Center / Hustle up the Hancock !!! Join our Respiratory Health Association of Metropolitan Chicago - "Hustle up the Hancock" climb up the John Hancock Center! In 2003 the "Hustle" was my first stair-climb. In the four times we've climbed the Hancock since then, we've raised $160,000 for the Respiratory Health Association of Metropolitan Chicago. (Formerly the American Lung Association of Metropolitan Chicago)(Long story...) We were the highest fund-raising "family team" in 2005 and the highest team, period, in 2006. My team ROCKS! RHAMC has also helped with publicity, which allowed me to tell a lot of people about living with lousy lungs, organ donation, and about the beautiful girl who saved my life - which is so very special to me… The last few years, some of Kari's close friends from Iowa have come out to climb with me on my team. They are now my close friends. Please Note: Do NOT sign up for the climb before 8:00 a.m. on November 3!!! If you do, you are committing to raising $1,000 for the American Lung Association as a Lung Health Champion. Full climb registration on November 3rd is $110 with no further fundraising commitment. Join our Damon Runyon Cancer Research Foundation climb up the Sears Tower! 103 Floors, 2,109 Steps! The World's Longest Urban Stairclimb! On April 12, 1973, on the day of my 13th birthday, I was diagnosed with cystic fibrosis at Children's Memorial Hospital. They guided me and my family and gave us the discipline we needed to take care of me for the rest of my life. When I was diagnosed at 13, life expectancy of a CF patient was 14 years. Children's Memorial helped plant the seeds that allowed me to survive to four days before my 40th birthday. They gave me time to wait until Kari saved my life.